In Palestine Under Egyptian Rule. 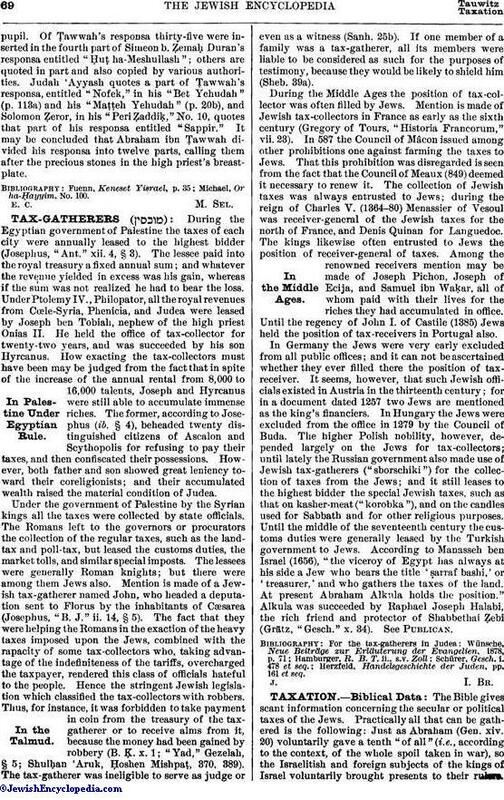 During the Egyptian government of Palestine the taxes of each city were annually leased to the highest bidder (Josephus, "Ant." xii. 4, § 3). The lessee paid into the royal treasury a fixed annual sum; and whatever the revenue yielded in excess was his gain, whereas if the sum was not realized he had to bear the loss. Under Ptolemy IV., Philopator, all the royal revenues from Cœle-Syria, Phenicia, and Judea were leased by Joseph ben Tobiah, nephew of the high priest Onias II. He held the office of tax-collector for twenty-two years, and was succeeded by his son Hyrcanus. How exacting the tax-collectors must have been may be judged from the fact that in spite of the increase of the annual rental from 8,000 to 16,000 talents, Joseph and Hyrcanus were still able to accumulate immense riches. The former, according to Josephus (ib. § 4), beheaded twenty distinguished citizens of Ascalon and Scythopolis for refusing to pay their taxes, and then confiscated their possessions. However, both father and son showed great leniency toward their coreligionists; and their accumulated wealth raised the material condition of Judea. Under the government of Palestine by the Syrian kings all the taxes were collected by state officials. The Romans left to the governors or procurators the collection of the regular taxes, such as the land-tax and poll-tax, but leased the customs duties, the market tolls, and similar special imposts. The lessees were generally Roman knights; but there were among them Jews also. Mention is made of a Jewish tax-gatherer named John, who headed a deputation sent to Florus by the inhabitants of Cæsarea (Josephus, "B. J." ii. 14, § 5). The fact that they were helping the Romans in the exaction of the heavy taxes imposed upon the Jews, combined with the rapacity of some tax-collectors who, taking advantage of the indefiniteness of the tariffs, overcharged the taxpayer, rendered this class of officials hateful to the people. Hence the stringent Jewish legislation which classified the tax-collectors with robbers. Thus, for instance, it was forbidden to take payment in coin from the treasury of the tax-gatherer or to receive alms from it, because the money had been gained by robbery (B. K. x. 1; "Yad," Gezelah, § 5; Shulḥan 'Aruk, Ḥoshen Mishpaṭ, 370, 389). The tax-gatherer was ineligible to serve as judge or even as a witness (Sanh. 25b). If one member of a family was a tax-gatherer, all its members were liable to be considered as such for the purposes of testimony, because they would be likely to shield him (Sheb. 39a). During the Middle Ages the position of tax-collector was often filled by Jews. Mention is made of Jewish tax-collectors in France as early as the sixth century (Gregory of Tours, "Historia Francorum," vii. 23). In 587 the Council of Mâcon issued among other prohibitions one against farming the taxes to Jews. That this prohibition was disregarded is seen from the fact that the Council of Meaux (849) deemed it necessary to renew it. The collection of Jewish taxes was always entrusted to Jews; during the reign of Charles V. (1364-80) Menassier of Vesoul was receiver-general of the Jewish taxes for the north of France, and Denis Quinan for Languedoc. The kings likewise often entrusted to Jews the position of receiver-general of taxes. Among the renowned receivers mention may be made of Joseph Pichon, Joseph of Ecija, and Samuel ibn Waḳar, all of whom paid with their lives for the riches they had accumulated in office. Until the regency of John I. of Castile (1385) Jews held the position of tax-receivers in Portugal also. In Germany the Jews were very early excluded from all public offices; and it can not be ascertained whether they ever filled there the position of tax-receiver. It seems, however, that such Jewish officials existed in Austria in the thirteenth century; for in a document dated 1257 two Jews are mentioned as the king's financiers. In Hungary the Jews were excluded from the office in 1279 by the Council of Buda. The higher Polish nobility, however, depended largely on the Jews for tax-collectors; until lately the Russian government also made use of Jewish tax-gatherers ("sborschiki") for the collection of taxes from the Jews; and it still leases to the highest bidder the special Jewish taxes, such as that on kasher-meat ("korobka"), and on the candles used for Sabbath and for other religious purposes. Until the middle of the seventeenth century the customs duties were generally leased by the Turkish government to Jews. According to Manasseh ben Israel (1656), "the viceroy of Egypt has always at his side a Jew who bears the title 'ṣarraf bashi,' or 'treasurer,' and who gathers the taxes of the land. At present Abraham Alkula holds the position." Alkula was succeeded by Raphael Joseph Halabi, the rich friend and protector of Shabbethai Ẓebi (Grätz, "Gesch." x. 34). See Publican. Herzfeld, Handelsgeschichte der Juden, pp. 161 et seq.